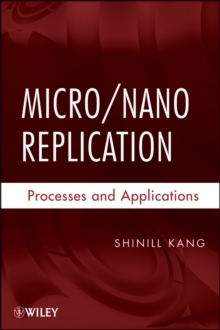 An introduction to micro and nano replication processes and applications Micro/Nano Replication: Processes and Applications provides an overview of the fundamentals, processes, and applications involved in micro and nano replication in the manufacturing of product parts. A major field of nanotechnology, the study of micro/nano replication is sure to become one of increasing importance as the construction of completely new devices based on innovative concepts and crafted at the molecular level increases. Designed to help the reader understand and learn to work with the growing number of tools for molding plastic components, the book covers the key topics related to replication, including patterning technology, the modification of mold surface properties, and much more. In addition, it addresses the strengths and weaknesses of different molding processes. With a strong focus not only on how micro/nano replication works, but also the broader implications for the industry, the book is packed with examples of real world applications. These are drawn from a variety of fields, including information storage devices, optoelectronic elements, optical communication, and biosensors, in order to provide a complete view of the importance of micro and nano processes. A valuable introduction to a new but fast-growing field, Micro/Nano Replication is an essential resource for anyone looking to get a head start on understanding this emerging discipline.